YUKON – Vancouver-based ATAC Resources reports that it has discovered gold and copper skarn at the Bobcat target. Bobcat is within the Rau project at the western end of the Rackla gold property 55 km northeast of Keno City in the Mayo district. This year’s exploration is following up on high grade rock samples collected in 2010 and 2012. Preliminary hand pitting returned grab samples including 6.07 g/t gold with 7.41% copper and 5.08 g/t gold with 3.69% copper. An open ended 1.5 by 2.0 km multi-element soil geochemical anomaly associated with a large magnetic low was also identified. 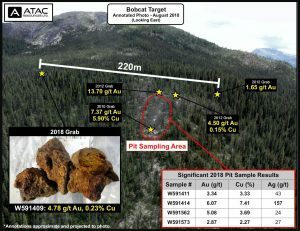 ATAC says the Bobcat results point toward gold and copper skarn mineralization that is more widespread than previously thought. “The potential to have gold-rich skarn mineralization at Rau is a significant development, as these types of deposits can be relatively high grade and are often associated with copper-gold porphyry systems,” states Rob Carne, the chair of ATAC’s technical committee. More information about Rau is available at www.ATACresources.com.